This was my Grandpa's track. I would be very interested in any photos anyone has. i think you can still see part of the wall on the front strech spend a lot of sundays there i ways a go time family had 3 cars that raced there. i live on 10acres of the jeddo speedway, south end. my dad (don) has told me many stories of the track. dad use to help grade the track. still can see the old coke coolers, by the wall. my driveway is part of orginal driveway & ticketbooth. The track is visible on historicaerials. com, just search for Jeddo MI, from 1959 showing both the 1/2 and 1/4 tracks, and in 1964 just the 1/4 remains. it is directly to the south of the woodlot pictured here, the 'bottom' (probably 3-4?) turns of the track seem to be still barely visible on google earth. rusty says hes looking for pictures from jeddo speedway. i do have some if he wants to see them have him contact me. also my family use to race there. Rusty There was a family that lived or lives in Jeddo by the last name of Grillo or something like that they raced there and at Motor City Speedway, the boys names were Evan and Hank, think they lived north of the track. Anyone have any old photos of the track, races, ect. I would love to have some copies. I live in jeddo and would love to put some pics in my bar. Was there many times, never many cars:A few things I remember it was very hard to see the cars in turn 1 and 2 Cliff Richardson and Wild Bill Evens had a match race there, it way HYPED on the local radio station for about a week. Remember the Jacobs Brothers taking Cliff Richardsons NEW chevy coupe with a GMC 270 6 banger in it for a ride and they dumped it in turns 3-4, was not even painted yet, this happened after the regular racing was over for the day. I always remember going home ans stopping at the Dorsey House for a berger and a cold soda. It opened May 27, 1951. Dondi Don - April 8-2006 Correction Jeddo Race Track was 1 mile N O R T H of the Village of Jeddo, on the Wildcat Road on the South West Side of Wildcat at the corner of Fisher Road. If Dondi Dons location of the track is correct, then the track wouldve been 1 mile NORTH of Jeddo. I started out as a half mile track, then they turn it into a 1/4 mile track. I remember one time there wasnt many cars there, the announer said there was bunch of cars coming from detroit, only one car show up. the track was too far in the country, to be successful. 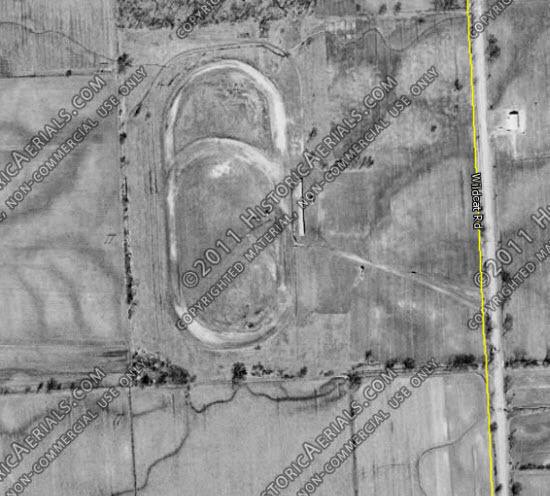 Jeddo Race Track was 1 mile west of the Village of Jeddo, on the Wildcat Road on the South West Side of Wildcat at the corner of Fisher Road.